ACTION ALERT: Please mark your calendars and stand with Rev. Pinkney in his heroic struggle against racism and oppression in Benton Harbor - July 19, 2008: Mass Demonstration in support of justice for the earth and it's people. UPDATE: Pinkney is still on House Arrest wearing an electronic tether. Despite lack of evidence or credible witnesses for the prosecution, on March 21, 2007 an all-white jury found Rev. Pinkney guilty of election fraud. One of the jurors lied and stated that Rev. Pinkney's attorney was in the parking lot making a drug deal. She was not removed. On May 14, 2007 six motions for retrial were put forward. On August 24, 2007 all were denied. The reason? Rev. Pinkney failed to object on ALL the motions--corruption just keeps rollin'. 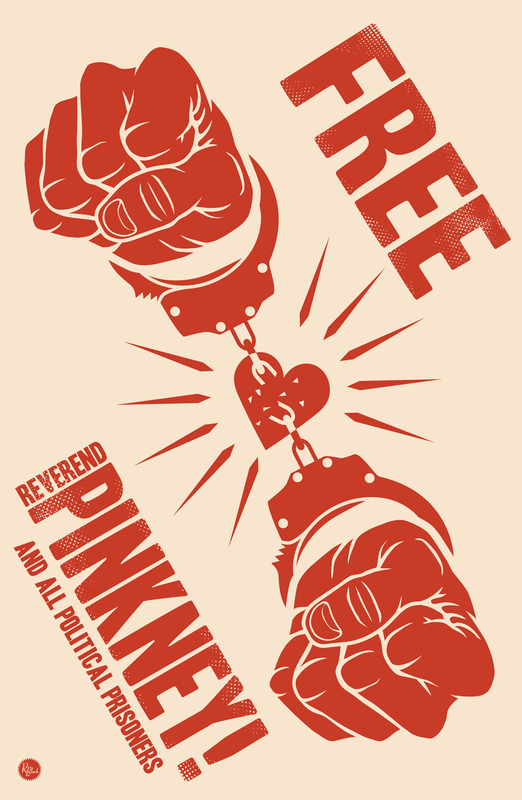 On Nov. 21, 2007 Pinkney filed in the State Appeal Court for a new trial demanding justice. Rev. Pinkney is bankrupt and funds are urgently needed. He must reimburse Berrien County for the first transcript of $2800., court costs of $6,405.00, probation fee of $4,000., and transcript fee of $5,000. As this truism becomes more and more applicable to our nation we see the silent drama of this reshaping of governing institutions to suit corporate power being played out in our own small communities, townships and moderate sized cities all across the country. Nowhere is the gut wrenching human cost of these practices more palpable than in Benton Harbor, a once thriving community of African American businesses and vibrant neighborhoods. Whirlpool, the corporate giant whose headquarters are located here, is relentlessly engaged in grinding the residents here into the dirt with no regard to their legal rights, the historical integrity of the community, or for modern ethics of any sort. This gigantic corporation has, through blatantly fraudulent means, placed their pawns into key positions to ensure procurement of the public land held in trust for the Benton Harbor citizens. They plan to use this land to establish exclusive private parks, fenced golf courses and gated compounds for their highly paid executives and management personnel. After devouring all the valuable park and lakefront realty here for a pittance of their true value, Whirlpool then plans to "give back to the community" in the form of the most menial and hopeless employment opportunities--janitorial and landscape maintenance. This "new jobs success story" will then allow Whirlpool to take the poverty stricken state of Michigan's tax breaks as a reward for having "created" the new jobs. The tax payers in Michigan will thus supply corporate welfare to an entity that is destroying their communities, usurping their treasured public lands and parks, and racially oppressing the people in them. Racism, fascism and corporate greed have traditionally gone hand in hand worldwide. Nowhere is this more evident than here in our very own state of Michigan in Berrien County. These two communities are adjacent to opposite sides of the same river; the stark numbers tell a story and the story includes the grinding poverty, the systematic dehumanization most often associated with the world's most notorious fascist dictatorships such as Nazi Germany, with its walled compounds, economic enslavement and ultimately -- death camps. How is this happening here in our United States, the onetime beacon of freedom and liberty to a weary world? Ask Rev. Pinkney this question -- a man who has waged a David and Goliath struggle against the giant Whirlpool for years here in Benton Harbor--and you will hear a tale of-out-of-control law officers and the senseless killing of a young black man, ensuing riots and the beginning of an intense monitoring of courtroom proceedings at the Berrien County Courthouse. Pinkney and his loyal band, BANCO among them, also picketed the local papers (including The Herald Palladium owned by a wealthy Paxton, KY family) demanding that they supply objective news reporting and coverage of those involved in these racist and corrupt proceedings. BANCO and Pinkney were successful in obtaining the recall of a corrupt city commissioner named Glen Yarbrough who was in the pay of Whirlpool. This recall was overturned by the power elite and they attempted retribution against Pinkney in the form of charges of election fraud and vote tampering, saying that Pinkney paid for votes and had absentee ballots in his pocket, both of which charges were completely unfounded. The first trial, with a jury which included two blacks, resulted in a hung jury. A new trial was ordered and the residents of Benton Harbor came out in support of Pinkney both inside the courthouse and in the surrounding parking area. The residents of Benton Harbor are united in their opposition to the usurpation of their community by Whirlpool and they are demanding a full investigation into this affair by the Senate Judiciary Committee. By attacking and criminalizing Rev. 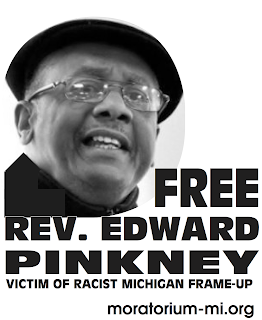 Pinkney--who has done nothing but demand fair court proceedings and truthful news coverage for his community--the power elite hope to stop any further initiatives among the oppressed community to stand up to racism, economic exploitation and the passing of public land and funds into corporate hands. We can't wait for others to defend us. Corporate fascism and racism MUST STOP. Will our communities and loved ones be the next in line for corporate take over? Your support is urgently needed both in Rev. Pinkney's heroic struggle for justice and fair courtroom proceedings and the ongoing battle to stop the corporate takeover of public land and community assets. We must all demand the resignation of corrupt Judge Alfred Butzbaugh and his dishonest prosecutor Gerald Vigansky.